Many people are unaware of exactly what their muffler does until it breaks. A muffler’s main job is to control engine noise, so when they break down you’ll notice things get very loud (and neighbours get very unhappy)! However, today’s mufflers are also a way to increase the performance of your vehicle. Read on to learn a bit more on how mufflers work and what they do for your vehicle! Inside a muffler are a set of tubes. These tubes are perforated and are designed to reflect sound waves produced by the engine to minimize the noise that eventually leaves your vehicle (while also acting as a way to remove exhaust gases from the engine). 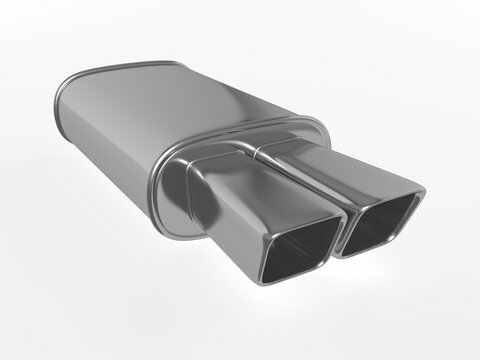 The exhaust, along with the sound waves, enter the muffler through a center tube. They then bounce off the back wall of the muffler and are pushed into the main body. Once in the main body of the muffler, they pass through a series of holes that takes them through the last chamber and out the exit pipe. As your engine runs, it generates thousands of little sound bursts as highly pressurized gas is released. These sounds travel down your exhaust pipe, and would be very loud if not for your muffler. The coolest thing about your muffler is that it’s meant to “tune” your engine’s sound output. This means that different types of mufflers will give you different sounds. So whether you are looking to make your vehicle as quiet as possible, or get a deep growling sound, there is a performance muffler out there for you! Mufflers are also used to increase the performance of your vehicle. How so? Basically, the faster your engine can get rid of exhaust gases, the faster it can take in oxygen and generate more power. By that standard, you might be thinking that no muffler is the way to go – unfortunately, that will get you a hefty noise violation ticket from your local police as noise levels are strictly monitored. The good news is that muffler experts have created many efficient designs that minimize exhaust exit time while still keeping in line with noise regulations. Looking for a New Muffler? If you’re searching for a new performance muffler to add to your vehicle, talk to the experts at Park Muffler. Our team will find you the perfect muffler for your vehicle performance and sound needs.